Rajnath Singh said the prime minister worked for the poor, farmers and weaker sections of society during the past four and a half years of his tenure. 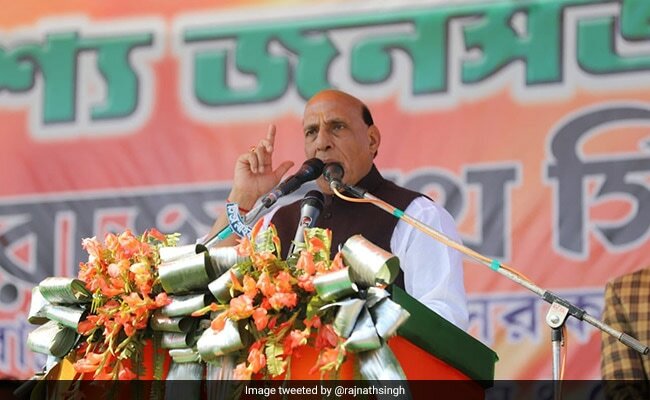 Home Minister Rajnath Singh on Monday praised Prime Minister Narendra Modi as a "cure" for problems facing the country and asserted he will be voted back to power in the Lok Sabha election that must be held by May. Mr Singh said the prime minister worked for the poor, farmers and weaker sections of society during the past four and a half years of his tenure. Addressing an event in Moradabad, he said "Chowkidar chor nahi, chowkidar pure hai. Next PM sure hai, problem ke liye cure hai," Mr Singh said, using the word Congress president Rahul Gandhi has used to attack Modi on the Rafale jet deal. Mr Singh's statement in English meant: "The watchman is not a thief, he is a pure man. He is sure to be the next PM, he is a cure for problems." Mr Singh also cited several central government schemes - such as Ujjwala Yojana of providing free LPG connections to poor households and Ayushman Bharat health care programme - to make his point. Mr Gandhi has repeatedly alleged PM Modi helped industrialists in getting defence contracts related to the deal. Citing former prime minister Atal Bihari Vajpayee, Mr Singh said he tested nuclear bombs in 1998 without caring about the warnings and threats from world powers and it was this courage that made India a nuclear weapons State. He said the opposition parties have lost moral authority and are criticising everyone - from the prime minister, to the president and the governors - who is going against them. In his 50-minute address, he also shared his experience as home minister and praised the Yogi Adityanath government in Uttar Pradesh.